Think of two opposite ends of a spectrum – on the one end, you have the game of Hungry Hungry Hippos in which players frantically grab at a bunch of marbles to try to collect the most. On the opposite end, think of a fine antiquities dealer, thoughtfully curating his inventory, adding only reputable, high-value pieces. Back in the day, the Hungry Hungry Hippos approach may have been a better strategy when adding email addresses to your list. The more inboxes you could reach, the merrier. Building an email list is vital, but you have to remember that it’s the quality of the people in your list that makes it viable. But In this era of data breaches and heightened information security, it’s not only harder to collect personal information, but the manner in which you collect it can have a huge impact on your business. Today, blasting inboxes willy nilly would be as effective as yelling into a loud, crowded nightclub. Your email would simply end up in an ocean of inbox clutter – never opened. Or worse, you could be blacklisted and labeled as a (gasp!) spammer. Today, it’s important to be a little more like that antiquities dealer – collecting email addresses in a thoughtful manner, in order to fill your list with quality contacts and preserve the reputation of your brand. When fueling the growth of your email list, there are ways to get loads of new email addresses, but it’s important to implement strategies that help you ensure the email addresses you collect are quality leads. This will also help you keep your list clean and full of conversion potential. To summarize, building an email list is vital, but you have to remember that it’s the quality of the people in your list that makes it viable. Read about tips and tricks to help you collect your best leads. Then, explore some creative ways in which to attract those leads. Double Opt-in might sound like a duplication of effort. If you get a “yes” when asking your boss for a raise, would you bother (or risk) following up with “are you sure?” This is essentially what you’re doing by adding a double opt-in to an email campaign. It feels counter-intuitive, but with all of the distractions and fine print in our lives, when collecting an email address, it’s a best practice to get a confirmation opt-in even after the first opt-in was given. In a nutshell, double opt-in lets you rest easy knowing that the people on your email list really want to be there. Add a Double Opt-in to any marketing campaign by adding an opt-in to a sign-up form and then a 2nd opt-in to an email autoresponder. Pretend you’re the owner of a high-end shoe store. It’s summer and you need to make some space for the in-coming Fall collections. By keeping tabs on your Jimmy Choo loyalists vs. those who have only purchased Prada, you can tailor segments of your email list with sale-specific headlines such as “Jimmy Choo Pumps – 40% Off”. Tracking info at the sales counter is one way to know what your customers like best, but there are other clever ways of collecting data that we’ll discuss later on. Contests, giveaways and other interactive marketing campaigns are powerful incentives. Additionally, if you’re offering a prize that happens to be something related to your business, those entering to win it, are highly qualified leads. For example, if you run a flower shop, people who enter to win a free flower arrangement a month for a year are obviously interested in fresh flowers. But if you decide to give away a generic prize like cash, or an iPad, the people who enter may not ever have any interest in flower arrangements and are unlikely to be good leads. If you’ve ever cleaned out your garage, or a closet, you know, that after time, the space gets cluttered again. Continually sending correspondence to your email list will help keep the “clutter” at bay because you’ll receive bounces and unsubscribes. Sort of like adding “Double Opt-In, this may feel counterintuitive when your goal is growth, but saying goodbye to those who no longer want to receive your emails is an important part of keeping a healthy list. When adding new flavors to your ice cream offerings, understanding where people are leaning in a political race, or even when working on a new tagline for your company, poll the opinion of your audience using a Vote to Enter Giveaway. First, display the options to be voted on. Then, when a vote is cast, the screen will refresh and an entry form revealed. This is a great way to collect leads as well as glean what’s popular with your customers — information that can help your business. The Pick Your Prize giveaway is unique in that it allows participants to select the prize they’d prefer to win. The selection is recorded with each entry. Not only does this user experience give the participant leverage in entering to win something they find truly valuable, it also gives you, the giveaway host, some insight into the individual tastes of the participant. Perhaps you give away two different make-up color palettes – one full of bold and glittery shades (great for a night out on the town) and one full of neutral tones (better for everyday wear). 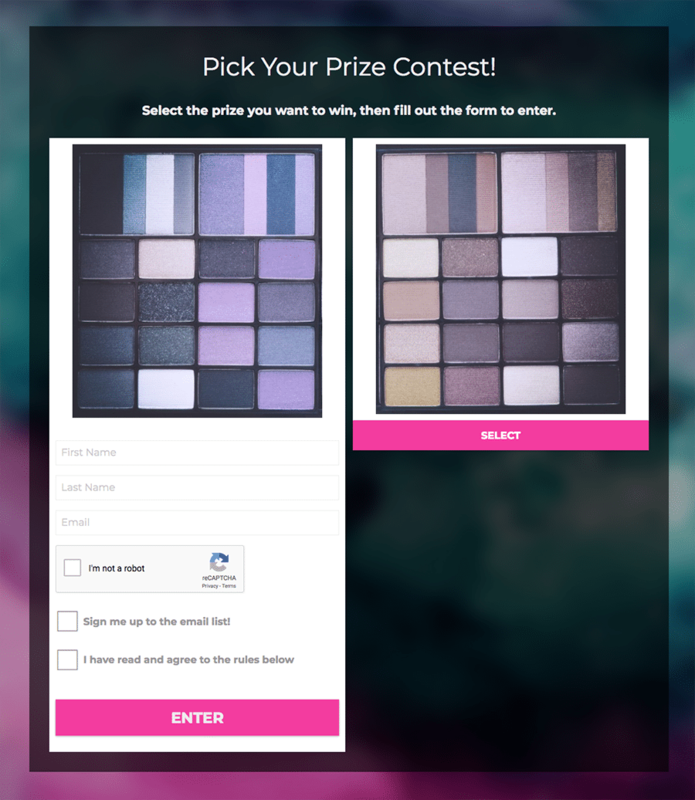 Knowing who selected which palette will help you market to those segments down the road. Surely you’ve seen one of these before. The Personality Quiz asks the participant a series of questions, and then delivers an outcome gated with an entry form. The power of a personality quiz is that it’s super fun, so you’re likely to get a lot of participation. As a bonus, like the Pick Your Prize giveaway, the Personality Quiz allows you to collect additional information – in this case, the participant’s outcome – to store for future segmented marketing. When someone opts in to get product updates, or news of product releases, it can only mean one thing – they’re a big-time fan of your business. Leverage this interest and loyalty by treating this list of leads as VIPs. Offer extra discounts for making advanced purchases prior to a product release. Send out free samples, or offer up a free trial. Lastly, asking for product feedback is a great way to engage these customers and keep them a part of your communications inner circle. A discount is a great incentive and versatile tool when collecting an email address. You can combine a discount with a giveaway as a bonus incentive. You can also use a discount to easily track the conversions from where and how you collected that lead. For example, offer a giveaway and include a discount code in an email autoresponder. Look to see how many people redeemed the discount code in your online store. This will tell you the exact number of conversions you received from your giveaway. You may even want to include these conversions as leads in a new list designed to foster repeat purchases and foster customer loyalty. Although building a viable email list may seem like a painstaking process, using contests, quizzes, giveaways and other types of interactive marketing can be a lot of fun for both you and your participants. Make sure you’re taking the extra steps to collect quality leads, and also to convert those leads into lasting, loyal customers.